This is not exactly a game but these What do you Love about Mom-to-be? Cards will make the mommy immensely pleased and happy. She can also keep these cards as a keepsake to recall the happy memories of her baby shower. It is always good to say some kind words so I am sure that your guests will like this game too. I have made these free printable cards in three different colors. You can print these in any color that you like. 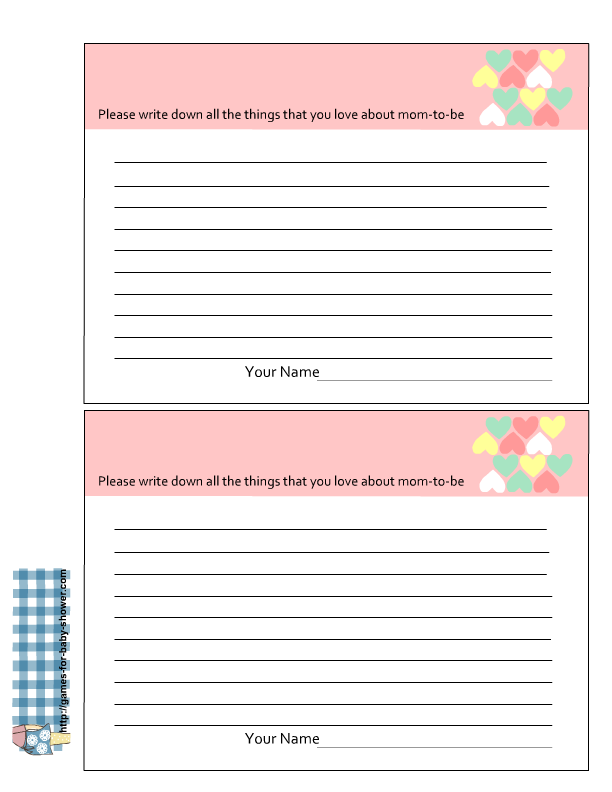 Print these cards on a heavy cardstock as that is durable and after getting these printed, cute each card around the edges. How to Play: Distribute the game cards among the guests and ask them to write down all the things on that card that they love about the mom-to-be. You can ask the guests to read their cards aloud or collect all the cards and give those to mom-to-be so she can read those. There will be no winners in this game so give some small thing to each participant. This is the first printable of these free 'What do you Love about mom-to-be?' Cards in pink color. Just click on the thumbnail image and a bigger printable image will open up. That image will be in PNG format, just save that or print that. Here is a set of these printable cards in blue color for a boy baby shower. These beautiful cards are decorated with colorful hearts. I am sure that mom-to-be will be really pleased and keep these cards forever. Here are these cards in an adorable yellow color. If yellow color is close to the theme of your baby shower or the mom-to-be loves yellow color more, you can print these cards in yellow color.